Ding Junfang, Wang Xujiao and Li Yifei pose with their trophies at the 29th Weifang International Kite Festival opening ceremony in Weifang city, Shandong province, on April 21. One hundred models and singers attend the 29th Weifang International Kite Festival opening ceremony in Weifang city, Shandong province, on April 21. The 5th World Tourism Image Ambassador Contest (China) Awards Ceremony were held during the 29th Weifang International Kite Festival opening ceremony in Weifang city, East China’s Shandong province, on April 21. Wang Xujiao won the championship, Ding Junfang was runner-up, and Lin Yifei took third place. 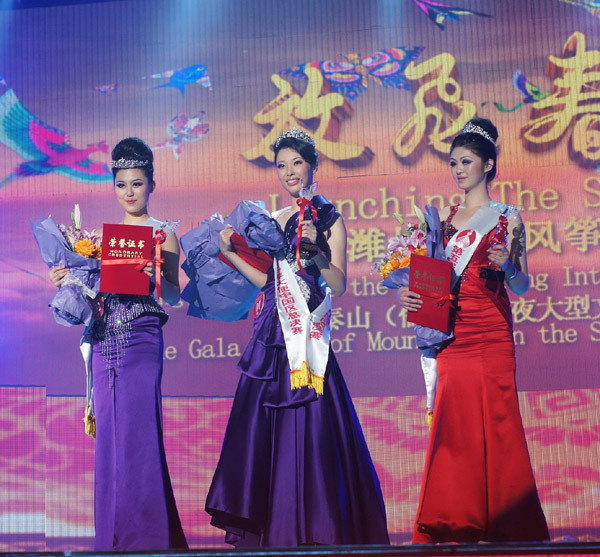 On April 19th, the “China Chabo City Cup” of the 5th World Tourism Image Ambassador Contest (China) was launched in the Richmond Grand Hotel in Weifang city. 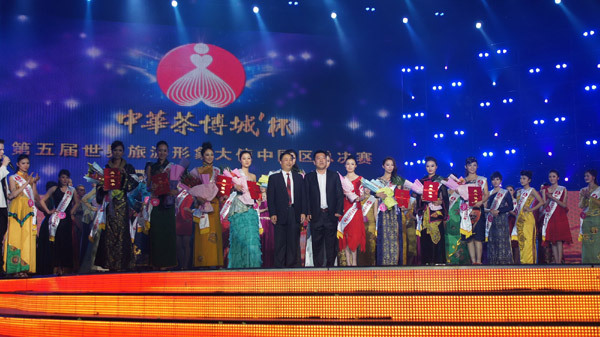 After appearing in swimsuits and evening dresses as well as a talent show, the final champion, runner-up, third place and other top 10 players were selected. The image ambassador contest was hosted by the Asian-Pacific Area Tour Union, Shandong Tourism Trade Association, The People’s Government of Weifang and Shandong Business Daily. He Guangye, chairman of Asia- Pacific Tourism Organization, presented the award to Wang Xujiao at the 29th Weifang International Kite Festival opening ceremony in Weifang city, Shandong province on April 21.